If you take measurements in alkaline environments, now you can use buffer solutions at pH 9.18 in addition to pH 10 buffers. 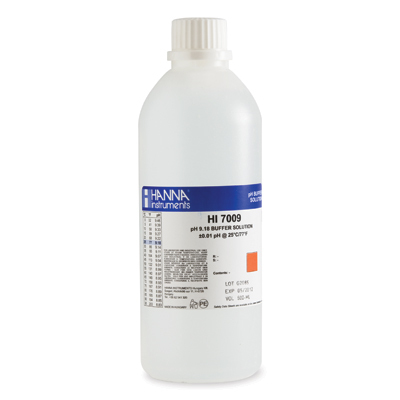 This means better accuracy and versatility, especially with HANNA® microprocessor pH meters, which can be calibrated at both pH 9.18 and pH 10. All pH 9.18 solutions show the batch number, the expiration date and have a pH/temperature correlation table on each bottle. HI 5091, HI 6091, HI 70009C, HI 7009L/C & HI 8009L/C are provided with a certificate of analysis.